I was going through divorce. Three years before, I had lost my daughter to illness. Grieving the loss of a child was heartbreaking, and so was the realization that I was ending a relationship with the one person who had a shared memory of her. I had been through divorce before, when I was in my twenties. Had I not been able to learn from that experience? Why did it happen again? Have I ever really been happy in a relationship? Have I ever been happy with my life choices in general and career choices in particular? Have I ever been happy with myself? Do I even know who I am? All these questions were on my mind when I entered a book store in Germany in 2014. I was just strolling around when all of a sudden a title caught my attention: “Do you want to be normal or happy?” What an interesting question. I grabbed the book and couldn’t put it down. Reading through the contents, I could see that here they were, the answers to many of the questions I had been asking myself for quite some time. So I bought the book and have read it several times since. This book has changed my life. Let me give you a brief introduction. The book consists of three parts. 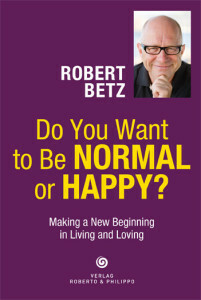 Part one is about “How normal people make themselves unhappy”. 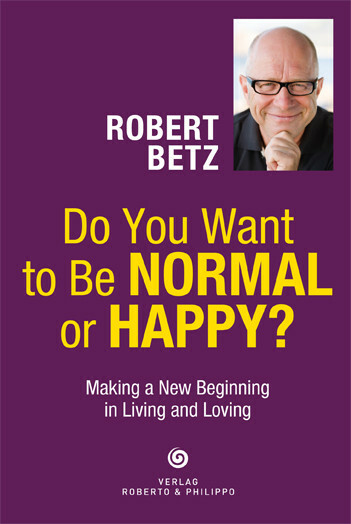 Robert Betz, a German psychologist, describes how all of us are influenced by the environment we grow up in. According to the author most people learn at a young age that in order to be accepted, we have to behave in a certain way. We have to meet certain expectations to be loved. We are not just loved for who we are, but love has to be earned. In the author’s opinion, the way people around us treat us and what kind of feedback we get about ourselves will shape us and will determine how we will think about ourselves going forward. For example a girl who is constantly being told that she could have done better instead of being praised, will not be able to build up self confidence. She will learn not to believe in herself and see herself as inferior. As a consequence of this thinking she will meet people who will confirm this negative opinion about herself. She expects to fail and will keep failing as this is what her mind is focused on. We are always looking for confirmation of our thinking and therefore we will experience what we expect to experience. In this first part of the book the author also describes the importance of our relationship to our mother and father and how this relationship will define all other relationships we will have. He states that most parents are still “enmeshed” with their mothers and fathers and have not yet found who they really are. They cannot teach us how to be happy, as they are not happy with themselves. Most of us are accepting things the way they are, because we are afraid of change. We don’t dare to be different, because we want to fit in. He points out how we often blame others without realizing that we can take responsibility for what happens to us. Chances are that you will completely fall in love with this book, like I did, or perhaps you won’t agree with it at all. It is definitely not for everybody and it will depend on what you are currently dealing with in your life, whether the book will resonate with you or not. Just allow yourself to think differently, be open-minded. In my case this book has been highly inspirational. It has helped me to see the patterns I have been stuck in and I am now on my way to finding the happiness I have always been looking for. Thanks for sharing this in-depth book review, Anita. I loved hearing you talk abou this book in class, and now I want to read this book even more.